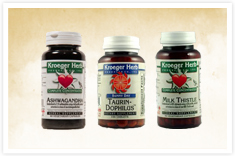 This unique product line of standardized herbal extracts contains a full spectrum of the plant's constituents, and the raw herb itself is used as the base. As a result, these products are made without solvents, flowing agents or fillers. Now with all vegetarian capsules.